Have fun bending and splaying the twelve "stems" of this metal bush into a pleasing design, and then add your own colorful bottles to create a unique garden sculpture. Placing empty glass bottles in the garden began as a superstition about capturing evil spirits. 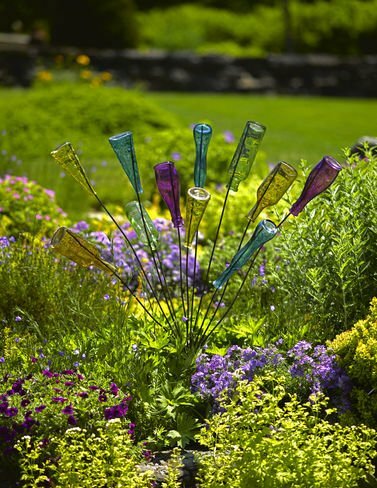 These days, a bottle tree is an easy way to create one-of-a-kind garden art, mark a special occasion or add sparkling color to a quiet spot in the garden. Hand-painted with a rustic finish. Bottles are sold separately.